It never ceases to amaze me how many design changes in the production of Austin Sevens were introduced as a gradual feature rather than when a new model was introduced. One example of this was the external seams at the rear of the RN were changed to internal seams in the months before the RP saloons were introduced. The RP design used internal seams, another was the continuation of the chrome radiator surround on vans after the Ruby style radiator cowl was introduced for the other models. There are a few interesting desiign features on the late Ruby MK2 (ARR), Chassis number 290,000+ first registered in 1939. The car has a metal rear roof infill with sliding roof, there is such a car in Cornwall but I don’t think it exhibits the following features. 1. The back end below the spare wheel cover is a different shape - it is swept back in a pronounced curve to accentuate the curved shape at the back of the car. There is no step - the curve down from the back is continuous. Beneath the skin, the steelwork is different, with a fabricated section bolted in underneath for support. The rear wings match the curve. 2. 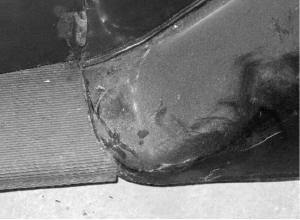 The front wings also have a curve in them at the back edge where they join the running boards. 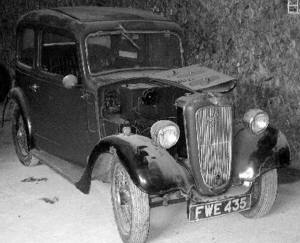 The edge wire runs round this curve - perhaps running boards were not always fitted? The running boards on this car are shaped at the front to match the wings. 3. The skirt below the front cowl is shaped differently from earlier cars and carries the number plate on a flat panel incorporated into the pressing. The starting handle is S-shaped to miss the mounted number plate. 4. There are no bumpers fitted to the car, though there is a sunroof. The area where the bumper would be bolted on the front has a cast steel frame bolted there instead that extends down to the front axle, supports the shock absorber, and extends out to the number plate holder. 5. There is no luggage carrier fitted and the spare wheel alcove is more of a boxy shape. 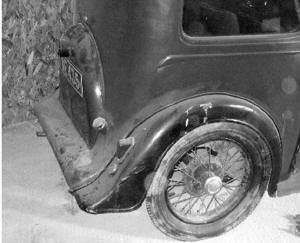 The spare wheel cover is the usual shape except it is retained at the bottom by heavy spikes rather than the usual small 'spades'. 7. There are odd other minor differences, such as a locating pin instead of the usual door rider plate and square pedals, but otherwise the car is as expected. Also what other quirks in the design features have you found on your Austin Seven, if you have found any original design modifications why not put pen to paper and record the information. You never know it may be useful to someone sometime. This article, was writen by Colin Morgan for the PreWar Austin Seven Club Magazine circa 2005 and reproduced in CA7C Seven Focus, March 2016 pp22-23. Colin has very kindly consented to the publication of the article on this website. If you have any more information about these modifications that could be added to this article, please contact the Webmaster.